Accent your home with this end table. This piece was made with traditional details such as squared corners, tapered legs, and a raised panel drawer front. The top includes two slate inserts, making this piece casual but stylish. Use the drawer to store TV remotes or magazines and place a decorative item on the open bottom shelf. The 4011 Table Group Rectangular Single Drawer End Table with Slate Top Inserts and Bottom Shelf by Null Furniture at SuperStore in the Williston, Burlington, VT area. Product availability may vary. Contact us for the most current availability on this product. 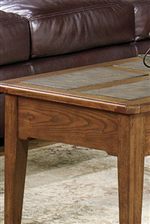 The 4011 collection provides you with quality casual occasional tables for your living room. These tables incorporate functional storage options including drawers and shelves, so you can maintain a clean and organized home. They feature beautiful wood tops with slate inserts and squared-off edges, updating a basic traditional design. Made with solid wood and veneers and completed with a medium brown finish, this collection will make your home stylish and warm. 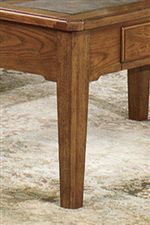 The 4011 Table Group collection is a great option if you are looking for Traditional Casual furniture in the Williston, Burlington, VT area. Browse other items in the 4011 Table Group collection from SuperStore in the Williston, Burlington, VT area.